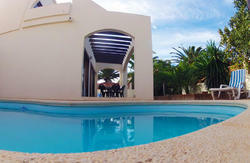 Centrally located surf house with big terrace, BBQ and pool, just a few minutes of walk to the ocean. Whether you would like to meet new friends or just enjoy and relax by the pool, La Paloma is ideal choice. Surfers, windsurfers, kitesurfers, travellers and everybody else are welcome to join us! Bathroom on the ground floor has shower, bidet and wc. Bathroom on the first floor has bath, bidet, wc, marble counter with twin sinks. Tiled two counter kitchen with hob, microwave, dishwasher, fridge, coffee maker, electric kettle, orange squeezer, yoghurt maker. Large light open living and dining room has two sofas and one large dining table to fit 8 persons. There is an arm chair in reading corner, and satellite TV with DVD video. Towels and bed linen are included in the price (changed every week), as well as final cleaning. Extra cleaning and change of towels and linen available on request but not included in price. From the airport take a bus no. 6 to Puerto del Rosario, and then no. 3 to Corralejo. 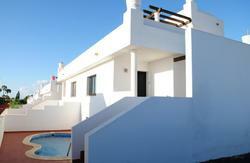 When you arrive to Corralejo, our address is Calle Marcelino Camacho Abad 1, just near the DISA petrol station. Corralejo is located 38km north from the Fuerteventura airposrt. If you are coming with the rentacar, just follow the signs for Corralejo (don't forget to turn right before Puerto del Rosario towards Corralejo). When you arrive to the town, take first exit on first roundabout and then second exit on second roundabout. Then you turn right in second street (calle Velero) and then left in first street, in which is our house located. Proceed to the petrol station and park somewhere before it. If you are arriving with the bus, take no. 6 to Puerto del Rosario, and then no. 3 to Corralejo. Both buses are driving cca every half hour. When you arrive to the bus station in Corralejo take a taxi or just ring us to pick you up.